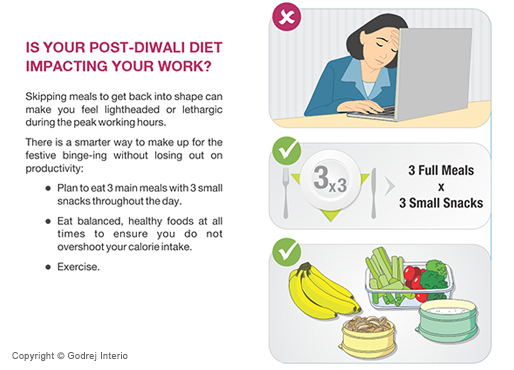 For people who are conscious about their diet and working too very hard to maintain weight or lose weight are the ones who will feel most guilty this DIWALI week. So Eat healthy this Diwali. How? I will tell you. Diwali is festival of celebration. There are sweets, snacks drinks all around you. 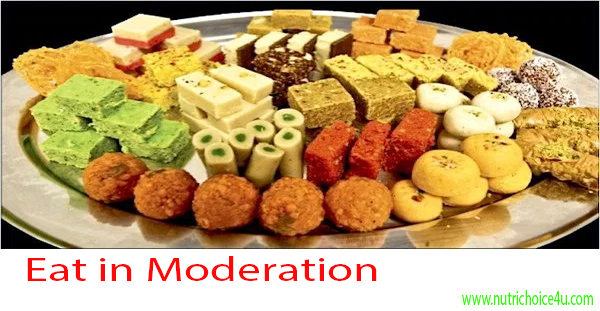 So if you are a dieter then it is very difficult for you to control yourself when people from all rounds are pressuring you to taste their special dishes and enjoy the festival feast. But do you think that you should be really guilty about it? I don’t think so you should be. If you are not at any end stage of disease where your diet will decide your life or death you should not be afraid of any celebrations. Yes I know, in most of my articles I talk about balancing and watching what you eat. So when I talk about balancing in exercise and your food, so here I will talk about focusing on other area of fitness if one area is completely back looked. So when you know that your ultimate calorie intake of the day is going high so it becomes very important that also you increase your activity levels to burn of those extra calories. Then this will help you to balance your fitness. So enjoy festival with mindful eating. Do not eat anything and everything being served to you. Choose foods which you like the most and eat consciously with measured amount. 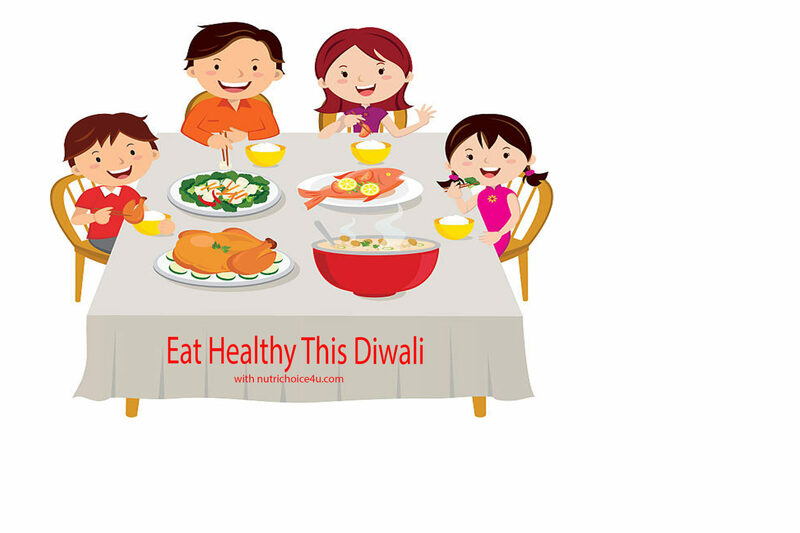 Here are ways which I follow to keep myself guilt free eating this Diwali festival. Keep a habit of chewing a gum when you feel there is too much food around you and you really don’t want to eat. Keep habit of drinking water before your feel or crave to eat anything junky. Try to eat fruits in meals when you feel that you are going to snack unhealthy. If you eat and you are guilty then only one thing you can do is burn that off. Go for exercise, run, swimming, gym etc. Come over your laziness and do your workout. Eat some ultra-healthy foods to combat from the unhealthy ones. Choose to eat oats, quinoa, milltes, whole grains, fresh fruits and veggies, no oil salads. Going on no sugar diet may be for a day and no fat diet on the other day. Also you can go for fruit duet for a day to detox yourself. No Alcohol. As this will be a add on poison. So festivals are definitely to enjoy but when it is bothering your fitness, you have to be extremely careful of how to balance it. I am sure this article will help you to have a better Diwali his year. 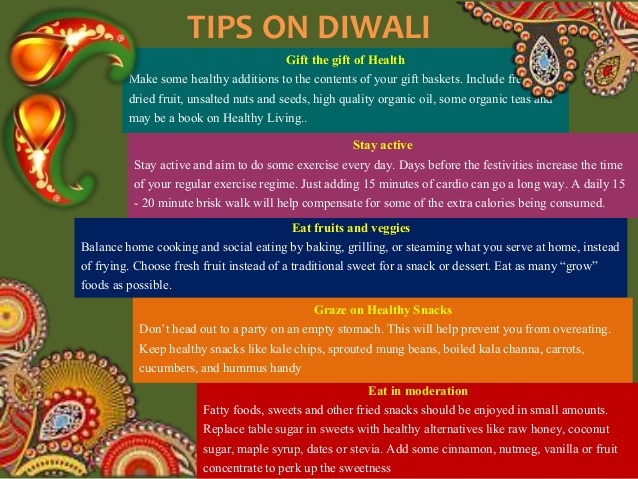 also sharing with you infographic which will help you to make your own diet routine post Diwali as well.